In Le Ride, Keoghan retraces the 1928 Tour de France riding an original vintage bicycle with no gears, riding the exact route and sticking to the same schedule. It was an average of 150 miles a day, completely circumnavigating France for a total of 3,338 miles in just 26 days, including the “Death Stage,” which took Keoghan almost 24 hours to complete. The film is available in all major VOD platforms in the US, Canada, UK and Ireland. Melissa Parker (Smashing Interviews Magazine): Phil, let’s talk about Le Ride first. Why did you feel compelled to tell this particular cycling story? Phil Keoghan: My wife and I, my producing partner and I, found this book about the first English speaking team to ride in the Tour de France. As cycling fans, we couldn’t quite believe that this story hadn’t really been told apart from this limited edition book, and it seemed sad to us that more people didn’t know the story. So we started talking about maybe how this would be a good subject for a film, but we really did not anticipate that it would end up being as big a challenge as it ended up being. Melissa Parker (Smashing Interviews Magazine): Didn’t the Kennett brothers (Paul, Simon and Jonathan), mountain bike pioneers, tell you that in re-enacting the 1928 ride, you didn’t know what you were letting yourself in for? Phil Keoghan: Yeah. We really didn’t. None of the riders from 1928 are alive. They’re all gone now, and there was no one we could sit down and interview to discuss it. Also there’s a limited amount of resources readily available, so we really had to dig around for years to find footage, to find photographs and to find newspaper articles and have them transcribed. To piece them all together was a giant jigsaw puzzle. For a long time, we had a wall that was about 25 feet long in the office here in LA where we had the entire film laid out on the wall. Every time we found a new archival photograph or we found some new footage, we would put it up on the wall on the timeline. Because we didn’t have anybody to sit down and interview, that’s what prompted us to, rather than tell the story in a traditional Ken Burns’ style where you have a voice of God and tell a story from the outside looking in, we decided we would tell the story from the inside looking out. That involved me having to find an original 1928 bicycle and then riding the exact course over the same miles. We hoped by doing that, then juxtaposing that with the 1928 story, juxtaposing the two stories of the two timelines over the same course that we would then be able to bring everything to life for the viewer. It was a pretty bold choice to do it that way because it was very difficult to find the balance between the two stories, the primary story being the team from 1928, and me and my buddy Ben who rode with me that was really the catalyst to be able to tell that story. So it was a challenging project to put together. Very challenging. Melissa Parker (Smashing Interviews Magazine): Was it just as much a mental challenge as a physical one? Phil Keoghan: It was definitely a combination of both. I can categorically say that it was the most challenging thing I have ever done in my life. I’ve never pushed myself that hard on any project, and the physical side of it, of course, is obvious when you’re riding 150 miles a day average on an 85-year-old bicycle that weighs twice as much as a modern bike. We’ve got seven stages over 200 miles, and one stage took us almost 24 hours. So that’s obvious that there’s going to be that physical strain. But on top of that, in making a movie in order to tell the story, we also had to get off our bikes to tell the story off the bike. That’s what really made it hard. If I was just focused on riding every day, and if I wasn’t stopping to shoot a movie changing batteries, setting up shots, meeting people, looking for landmarks and following the exact course, then it would’ve been a lot less stressful. Also it was a self-funded project so it was very grassroots. We were all wearing many different hats. I will never want to take on anything like that again. It was brutal. It was really brutal. Melissa Parker (Smashing Interviews Magazine): You’ve been cycling for years, so I assume you were in top physical condition for the race? 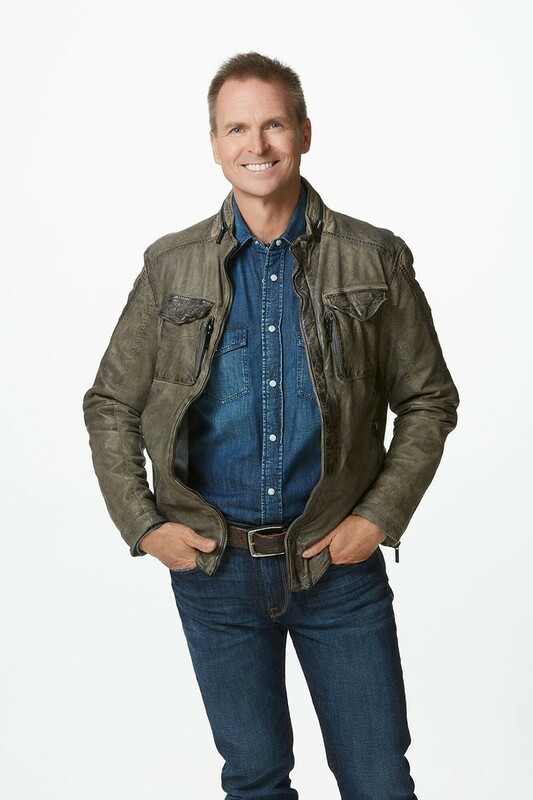 Phil Keoghan: I was in pretty good shape, but I had also just returned from Amazing Race. Amazing Race is a grueling project in itself. We shoot 12 shows in 21 days, so I don’t get a lot of time to work out. But it was really much more of a mental challenge than it was a physical thing. I mean, yes, I had to be fit, and yes, I had to be very fit, but it was much more about the mental challenge of it just trying to get through every day and to stay awake (laughs). It was very, very tough. Very tough. Melissa Parker (Smashing Interviews Magazine): On season 31 of Amazing Race, competitors come also from Survivor and Big Brother. In what other ways does it differ from season 30? Phil Keoghan: There’s a mixture of teams from the different shows, yes. It’s sort of like a showdown, I guess you could say. It was something that came about spontaneously, to be honest with you. It’s a very good season. Season 30 was really a pivotal season for us because of a new time slot, and we were given an opportunity by the president of CBS to go into that coveted Wednesday night time slot. I think the best thing about season 30 was just that given a really good time slot, we suddenly saw numbers that we hadn’t seen for about 10 seasons. So we were gaining attention in a way that we hadn’t for a long, long time. When you’re on Friday night … it’s not that it’s ever a bad thing to be on a network in primetime anytime. But getting a chance to go on a Wednesday night, then performing and seeing those numbers was extremely gratifying. So that’s really a big part of what helped to bring us back. The fact that we get a chance to come back is really an honor. Melissa Parker (Smashing Interviews Magazine): To what do you attribute the show’s lasting power? Phil Keoghan: I think it’s just that people are able to live vicariously through those that are on the screen. They get a chance to see the world through the eyes of the people that they connect with. That’s really what it is. So many times when we see the world, we see it in a negative light on the news, and I think we’re one of the few shows that gets to show the world in a positive light. Melissa Parker (Smashing Interviews Magazine): You’ve said that Amazing Race is grueling in itself. How do you prepare for it? Phil Keoghan: Yeah. That’s a good question. I get very fit before I go. I try to eat as well as I can. I try to get as much sleep as I can. We shoot 12 shows in 21 days. It’s very, very difficult. But, yeah, it’s just really a matter of trying to eat well and to get as much sleep as you can because you know you’re not going to get a lot of sleep (laughs). Melissa Parker (Smashing Interviews Magazine): There’s also a lot of sun and heat. Phil Keoghan: It’s a hard one. But I feel very lucky that I’ve been involved in some quality shows. I guess Le Ride, in a way, is like another Amazing Race. I’ve always admired the Tour de France as a race. I’ve always been attracted to races, and like Amazing Race, Le Ride has the human aspect, the appeal that anybody, regardless of whether you’re a cyclist or not or whether you’re on Amazing Race or not, the fact that you get to live vicariously through the racers is what connects people. A good story at the end of the day is a good story, you know? Melissa Parker (Smashing Interviews Magazine): As a youngster, what did you want to be when you grew up, Phil? Phil Keoghan: (laughs) I don’t know if I’ve grown up. I don’t know. I knew I wanted to tell stories. I just wasn’t really sure what the vehicle was going to be to tell those stories. I feel very lucky that I ended up being involved in Amazing Race. I’m now also working on Explorer. Also one of the things I’m really enjoying right now is that I have a new podcast out, and it’s called Buckit. I don’t have any sponsors. It’s something my wife, my producer partner and I, are doing to inspire people. I’m talking to inspirational people. I love it because I get to talk to really interesting people. I just talked to Jerry Linenger who’s a US astronaut who spent over 500 days in space. I’m really enjoying that because of the simplicity of it, just literally sitting down and talking to somebody. So to answer your question, I think I just always wanted to connect with people and hear their stories and share their stories. Melissa Parker (Smashing Interviews Magazine): And you’ve always enjoyed a dangerous adventure? Phil Keoghan: I didn’t really think about that, and I never really thought about being somebody who was interested in doing dangerous things. My dad says that when I was a kid, I was always taking risks and doing crazy things. I did break a lot of bones and fell out of a lot of trees. I have got a lot of stitches to show for my adventures, but I didn’t really plan to be a risk taker as such or an adventurer. I think it’s the stories that I’ve been fascinated with that helped lead me to the fantastic things I’ve done. But the experiences I’ve had did prompt the things on my list that included climbing Mt. Everest and going to space. I’ve never really thought about it as risky, I guess, just opportunities. That’s how I’ve always thought of it. Melissa Parker (Smashing Interviews Magazine): What’s left on your bucket list? Phil Keoghan: Well, a lot of stories that I still want to tell, and after listening to Jerry, it made me want to go to space. You hear this guy talking about his time in space and what it’s like to look down on the earth. I challenge anybody to listen to that podcast and not want to get on a rocket and go to space. He got me really fired up about getting on a rocket, to be honest with you (laughs). Melissa Parker (Smashing Interviews Magazine): Are you signing up for the first trip to Mars? Phil Keoghan: I don’t know about Mars, but I’m very keen to go into space. I would really love to go into space. I’d just love to look back on the earth from above the earth. I think that would be so cool. He definitely got me really excited about the opportunity to go up there. So I’m hoping that one day in my lifetime, that will happen. Melissa Parker (Smashing Interviews Magazine): Tell me about Explorer. Phil Keoghan: It started way back in the mid 1980s. It’s actually a very long running magazine show and really is about all the wonder in the world with really interesting stories. I end up going and tracking bears in Maine. I go down into a volcano into the belly of the beast with a volcanologist in Nicaragua and go look at stars from the Paranal Observatory in Chile. It features a number of National Geographic explorers, people who are out in the world doing extraordinary things, and it will be launching later on in the year. Melissa Parker (Smashing Interviews Magazine): I’m reminded of a recent event where suspected rhino poachers were eaten by lions at a South African game reserve. Terribly sad all the way around. Phil Keoghan: Yeah. It’s terribly sad that we haven’t found a balance to live with other creatures in some places, and we take it upon ourselves to try and control the world. It’s very sad. Melissa Parker (Smashing Interviews Magazine): Do you ever get tired of traveling? Phil Keoghan: I get tired, for sure, but not tired of traveling. I would be very sad if I was not able to travel. I really love traveling. I get tired. There’s no doubt bout that. But not tired of traveling. Melissa Parker (Smashing Interviews Magazine): Does your wife accompany you on many of your adventures? Phil Keoghan: It depends on the project, but yes, like the Buckit podcast we’re doing right now together and obviously when we did Le Ride, she was out in France with me. I was out with my parents as well, which was really great. Being a self-funded project, it’s very lean and mean. It’s kind of the antithesis of Amazing Race in terms of the resources and people you have around. We have a big crew on Amazing Race and a lot of resources, and on Le Ride, it was very lean and mean. Melissa Parker (Smashing Interviews Magazine): Is there anything you’d like to add, Phil? Phil Keoghan: Just that I’m very keen to share the Buckit podcast with people, and I presume you’ll let people know that Le Ride is available all across different VOD platforms. We’ve had a fantastic tour and did some fundraising with that, which was great as well. I’m just very keen to share inspirational stories with people. The bulk of everything I’m working on like Amazing Race is inspirational, certainly Le Ride is inspirational and the Buckit podcast is as well. That is sort of the overarching theme of everything. « Jon Meacham Interview: "What We Don’t Know Yet Is to What Extent Trump Has Changed the Presidency"